Black is a colour that you often see in homes thanks to its versatility that allows it to be used liberally to enable other colours to shine. 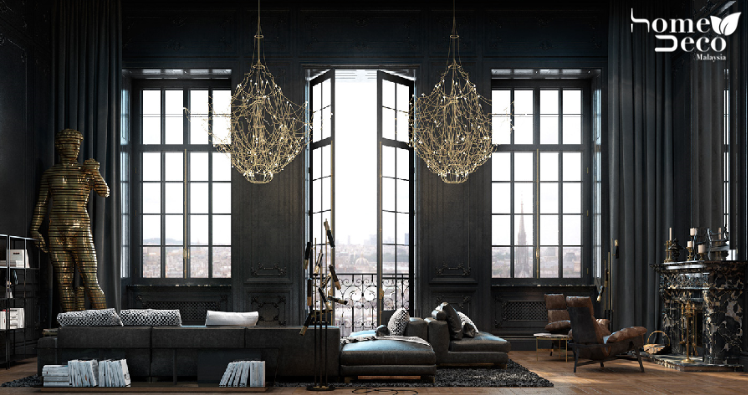 However, you don’t often see them totally decked out in black but this lovely two-storey apartment in Paris, France has got us totally enchanted with its elegant, dramatic use of black created by Iryna Dzhemesiuk and Vitaly Yurov from Diff Studio. The first thing you notice is that there are layers of beautiful blacks as they come in different shades that are layered on while various textures are used. There are glossy, smoky and matte blacks as can be seen in the living room while brass accents and an oak flooring helps to balance it out. The whimsical chandeliers used here are super quirky, as it looks like a spider’s web instead of the traditional chandeliers that you normally see. As the home is clad in black, it might get rather stifling but with the help of large windows and copious amounts of lighting fixtures that illuminate the house, it creates a beautifully luxurious ambience instead. The seating in the living room uses distressed leather that looks perfect for a lazy day home. Meanwhile, a huge statue of David presides over the living room and adds a touch of art but doesn’t overpower the rest of the decor as the home is big enough for such a majestic presence. A stately wall of ferns brings a breath of fresh air (literally!) into the apartment and grand Portoro marble accents are sprinkled around in the coffee table and kitchen countertop. The designers decided to take a little break from black in the kitchen and covered one wall in brass sheeting that makes the place look instantly glamorous. In here, there are lots of light which are built-in to the shelves which certainly makes it look more warm and friendly. Plus, you don’t have to worry that you can’t see what you’re cooking! All images are taken from Diff Studio unless otherwise stated.